Place the fish one by one into the water using a long handled spoon, being careful as it is hot. 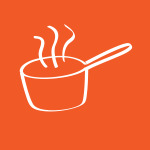 Place the lid on your saucepan and allow to simmer over a low heat for 8 to 10 minutes. When ready, serve in two soup bowls, placing a sprig of coriander on top. You could try scallops instead of white fish. Chunkier vegetables like carrots or butternut squash can be used instead of the courgettes and okra.